meaningful, we bring you TimePeace in the format of a blog. 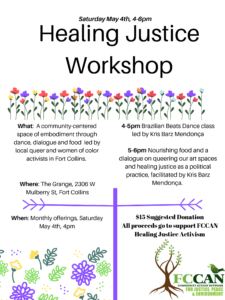 Here we will be highlighting the organizing work that stems from this long lineage of grassroots activism in Fort Collins with guest writers from the community, our affiliate groups, members of the spokes council, and all of the activist circles in between and amongst FCCAN has been fostering for the past twenty plus years. For our first post, we are so excited to bring you a flash from the past- an excerpt of one of our first TimePeace newsletters back in 1989. One of the most potent features of patriarchy is its invisibility- its ability to masquerade as the “natural”form of social organization. Becoming aware of the pervasive effects of male dominance- not only within distant power structures but also within our communities, relationships and souls- is a constant and revolutionary task. It requires us to question every institution in our society; to risk horror and anger; and above all, to lead the examined life…This issue of Timepiece is a forum of Fort Collins people exploring their perspective of feminism. It is offered in the belief that peace is not just the absence of war. It also requires the dismantling of those aspects of society- of our daily lives- which do violence to our persons and spirits. My experience with peace activism parallels my experience with feminism. Both movements inspired a deep and lasting passion, both gave me intellectual frameworks with which to decode the craziness of life in the late twentieth century, both rescued me from sleepwalking through the 1980’s, and both helped me begin the tremendous broject of learning to define and express my own identity. However, in spite of the fact that I see peace activism and feminism as essentially the same- challenges to the premises and privileges of power- they are not always the harmonious compatriots that I wish them to be. The premises I had built my life around, primarily my belief in the future, in eternity, in the fact that I too would one day be an ancestor, were suddenly called into question…As I studied the history of U.S. imperialism, I began to evaluate the complex psychology of oppression. How does oppression gradually assume the invisibility of normalcy? How are human beings made to feel powerless and complacent in the face of oppression, sometimes to the point of defending it? I remember reading about the Nicaraguan feminists’ struggle against institutionalized machismo and recognizing some uncomfortable similarities between the reality of their lives and mine. Around the same time, some of the other women in the Poudre Nuclear Freeze Campaign began to articulate their dissatisfaction with lack of women leadership in our organization by pointing out that the men were organizing the citywide referendum for a nuclear freeze and the women were organizing bake sales. I read the eloquent works of Adrienne Rich, Mary Daly, Alice Walker and Andrea Dworking, and their words brought a startling clarity and sense of grief to my life. 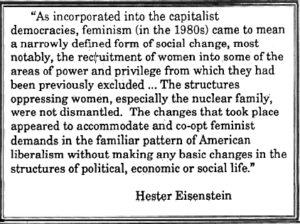 Finish reading and discovering more gems from Fort Collins feminists on topics that range from third world alliance, nonviolent resistance, and abortion rights in our community in the full PDF version of the 1989 TimePiece newsletter here. Trust us, its worth it! Are you interested in joining our writing group or being a guest blogger- get in touch here.